i’m Lexi, Buddy‘s new little sister! my new mama and papa adopted me last night from the Wag On Inn Rescue group – same place brother Bud-man came from – after searching for over a year for the perfect companion for him… i guess i’m quite special to have made the cut! i’m 4 months old, a little on the smaller side, but i hear my Pops will fatten me up in no time! 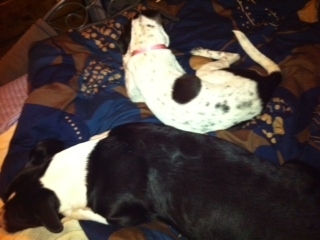 they think i am a pointer mix, but my foster mom really thought i am an english pointer. 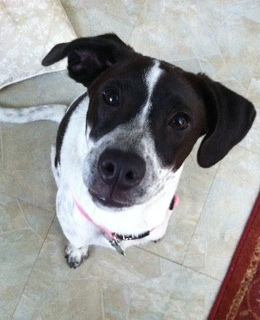 if you are ever thinking about getting a dog or cat, i highly recommend adopting a rescue like me. i was days away from being euthanized in a kill shelter in south carolina, just because they had too many animals and not enough support to take care of me. thankfully the Wag On Inn Rescue group realized how much of a cutie pie i was and whisked me away to new jersey where i found a loving home in a short time. if you would like some furter info on rescuing a dog or cat, ask my mom, she loves to spread the word on it. we may not be award winning purebreds with paperwork and lineage that can be tracked back through generations, but we have just as much love and licks to share!